Melbourne's street art started out as an artist's critical statement, usually political, in the early days but over the past several decades the art has come to play an important part for Melbourne's tourist industry. With city laneways and suburban streets now exhibiting some truly amazing artworks the gain in popularity has become quite a worldwide phenomenon. Melbourne contains a diverse range of street art. The 1970's and 1980's saw graffiti sprawling over suburban buildings and along railway lines. Today, any trip on any train through any suburb will prove to be a fun way to see just what our modern day street artists are all about. 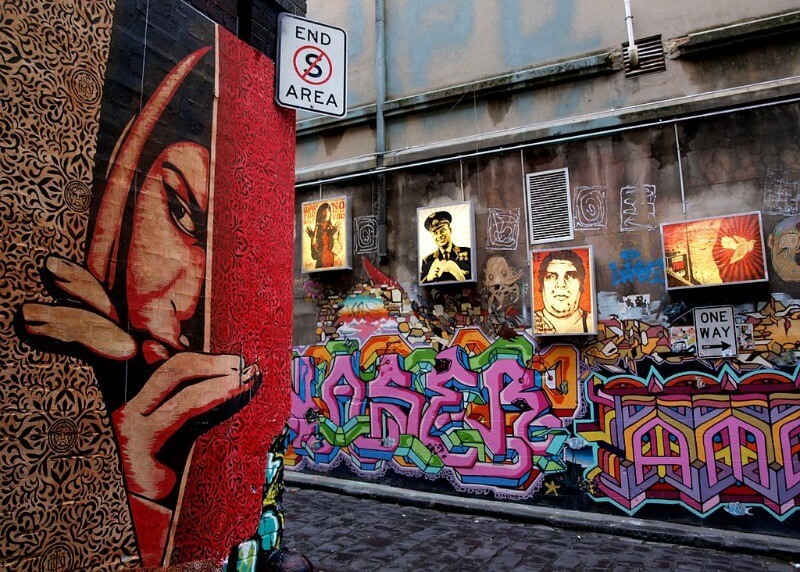 Melbourne is now known as the Stencil Capital of the World with stencil festivals held yearly throughout Australia. The first festival was held in 2004 and many major street artists were featured. In 2005 the documentary Rash explored the street art culture and some of Melbourne's more notorious graffiti and street artists. The film explores the value of unsanctioned public art and whether or not it contributes anything to society in what it portrays. 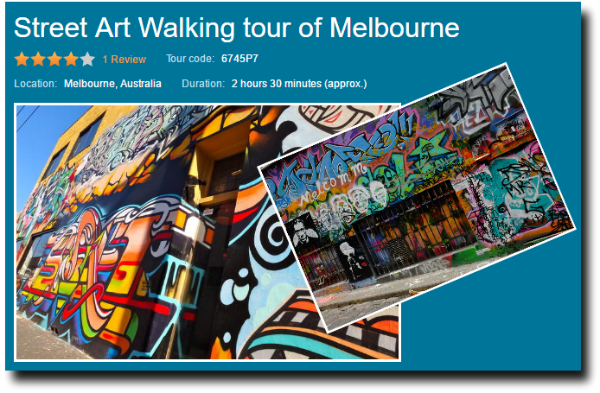 Walk the avenues and laneways exploring the exciting and always changing street art Melbourne provides or if you prefer to experience a professional guided tour you will receive an education as well as a wonderful insight into what street art is really all about. Click the 'Buy Now' button below for more information and prices. 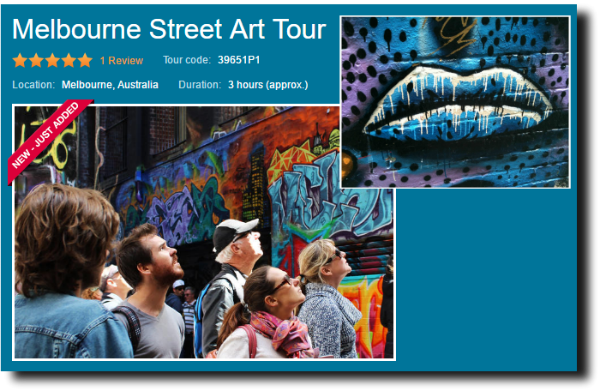 Melbourne Street Art Tours showcase the best of Melbourne's laneways and street art. As the tours are run entirely by street artists, they offer an authentic view into this underground art scene. Learn all about the stories behind the artists and the works, finishing up at the famous Blender Studios where you are treated to a cheese platter and drinks and have the opportunity to meet the studio artists. On this 2.5-hour walking tour you will delve into the cities popular hotspots and discover what it takes to be a graffiti/street artist. 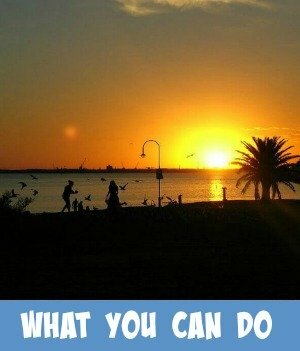 Discover the secret codes and lifestyles of a street artist as you learn about their techniques (fat caps) and the authority (fat cats) of the area. In 2006, the State Government "proudly sponsored" The Melbourne Design Guide, a book which celebrates street art Melbourne and graffiti from a design perspective. 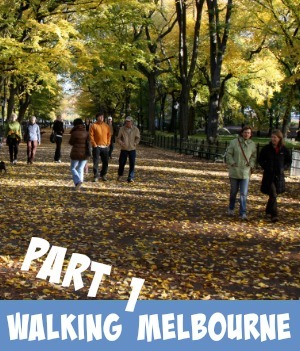 Offering an insight to the inner workings of Melbourne's design community. Full of hand-drawn maps and walking itineraries, the Guide is a direct connection to the pulse of this inspired city. 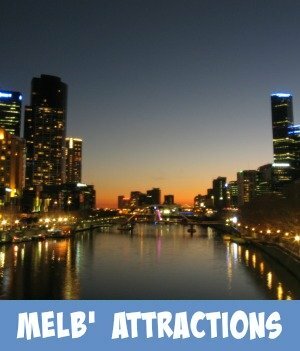 It will tell you all there is to know about architecture, fashion, art, graphics, objects and, of course, the stores, galleries, bars and restaurants Melbourne's creative community embraces and frequents. The 2009/2010 edition, for the first time, features two parts. 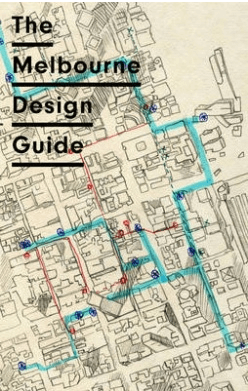 The first part helps readers find and explore design-oriented destinations. The second part introduces the design talent that often works away behind closed doors. There appears to be a constant battle with Councils, law enforcers and the artist as to whether Street Art is legal. There are hefty penalties for anyone found wandering the streets with spray cans. Some local councils have accepted street art and have even made efforts to preserve it. The preservation of Street Art Melbourne from a heritage perspective is difficult as Melbourne City Council states "Protection of street art is not practical. The only exception may be especially commissioned works". Social issues are a common thread with Street Art Melbourne, portrayed through words, paint, stencils and posters. For example this piece of street art portraying the homeless who often sleep on the street parks and benches throughout the city and its surrounding suburbs. Street Art Melbourne is here to stay. Whether it be in forms of art that remain permanently displayed on our buildings and public spaces or in works of ever changing graffiti statements, tagging and guerrilla art. Whatever forms the art takes on will remain as intriguing as the places in which it sprouts up. Sometimes you have to be quick to capture the message before it becomes obscured with the next round of social outbursts. Perhaps following someone like Street Art Melbourne @strartmelb on Twitter might help with the latest finds.